Congratulations, Marshawn Lynch! 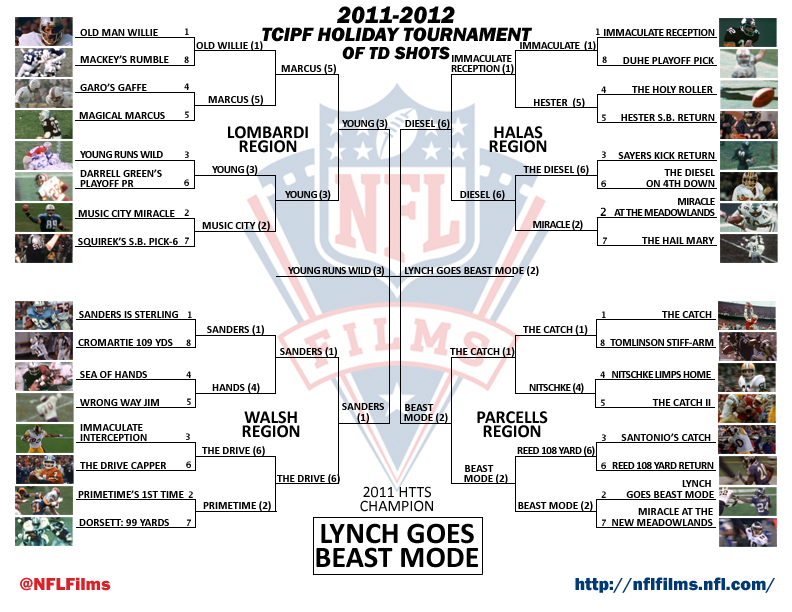 Your Beast Mode run versus the New Orleans Saints in the 2010 Wild Card Playoffs was voted the best touchdown shot! Steve Young’s touchdown had a great run through our tournament, including knocking off the #2 seed–The Music City Miracle–in the second round. But ultimately, the people spoke and Young couldn’t handle Lynch’s stiff-arm spectacle. Receiving 93% of the vote, Lynch’s touchdown run–as voted by you, the fans–will be in our Vault as the Best Touchdown Shot in the history of NFL Films. Have an idea for an NFL Films tournament? Tell us in the comments what you’d like to see!